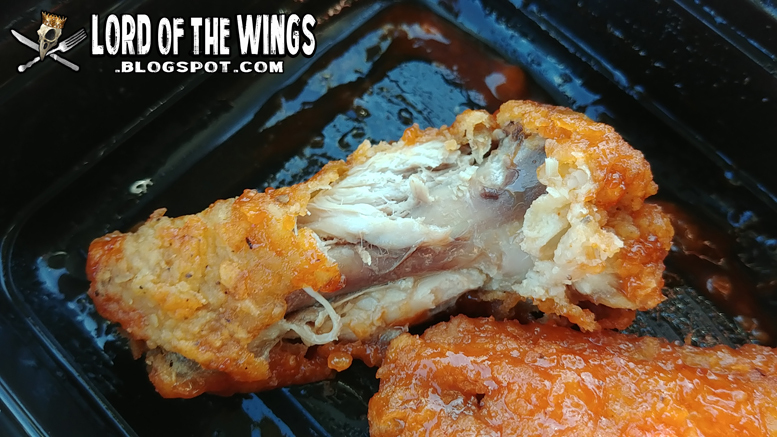 What is it with AYCE boneless events lately? 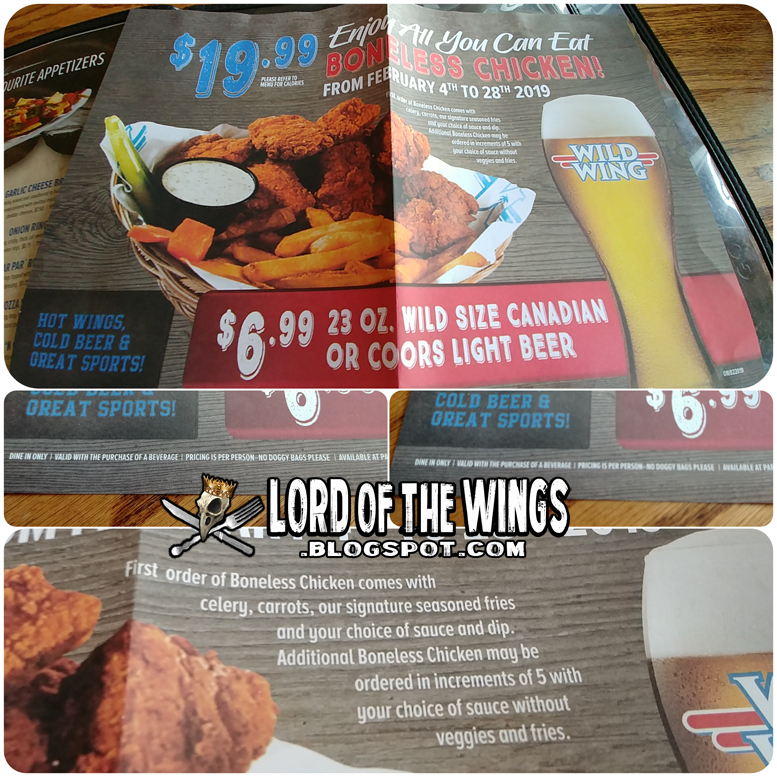 Last month St Louis had it, and this month it was Wild Wings. 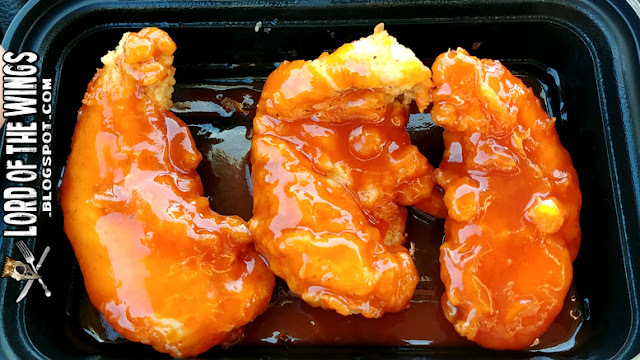 First off, hats off to calling it AYCE Boneless Chicken and not Boneless Wings, because it is chicken and not wings. Unfortunately I didn't get to try these until almost the last day (today is that last day). I had seen their advertisements on social media like the photo above, but just couldn't get there sooner. I've been to Wild Wings (not to be confused with the American chain Buffalo Wild Wings) many times before, but never to the location in Orleans. I was running errands and stopped in for lunch, where I was the first customer of the day. The location, like all others, has a wild west cowboy theme. This location is spacious and clean. Eventually more customers came; some seniors to the right of me, some seniors to the right, and a dude who went to the bar. I got to sit where ever I wanted and chose a booth with lots of window light. The tables all come pre-set with your condiment and cleanup caddy. I wasn't going to need a bone bucket, and because I ended up using a fork for my food, I didn't need the paper towel roll and the wetnaps as much, but it was appreciated. My waitress was Ally and she was cool. Checked on me frequently, answered my questions. They serve Pepsi products, and when I needed a refill she was on it. She was great, and I'll get into that more later on. 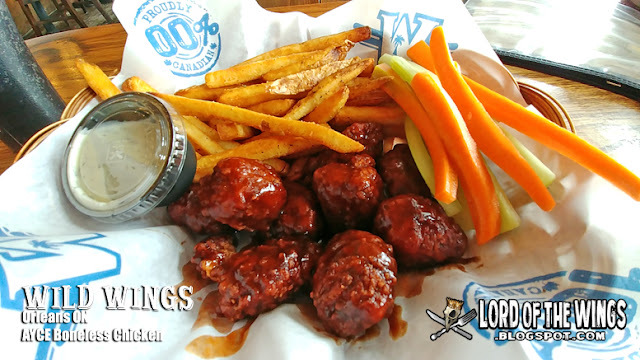 1st order of Boneless Chicken comes with celery, carrots, fries and dip. 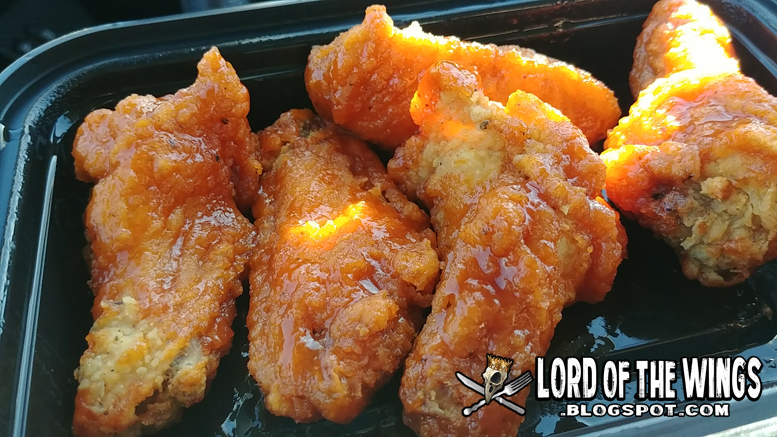 $20 for AYCE may not seem like a great deal on it's own, but considering a single order of Boneless Chicken is $15.95 and a double order is $27.50(!) as long as you get at least one refill, you are winning. After my meal I asked Ally what was the most she's seen someone order, and she had to think about it. She said I had done probably the best, but for most it was just a double order. She had a look on her face about that maybe me think there was more to that answer, and she said not very many people ordered it. It wasn't popular I asked, and she said not really. She said people were more interested in taking home their food (which you can't do under the AYCE) so they would order the Double order, Ally would point out how it's cheaper to do the AYCE, but they refused because they would rather take their meals home. Fascinating. 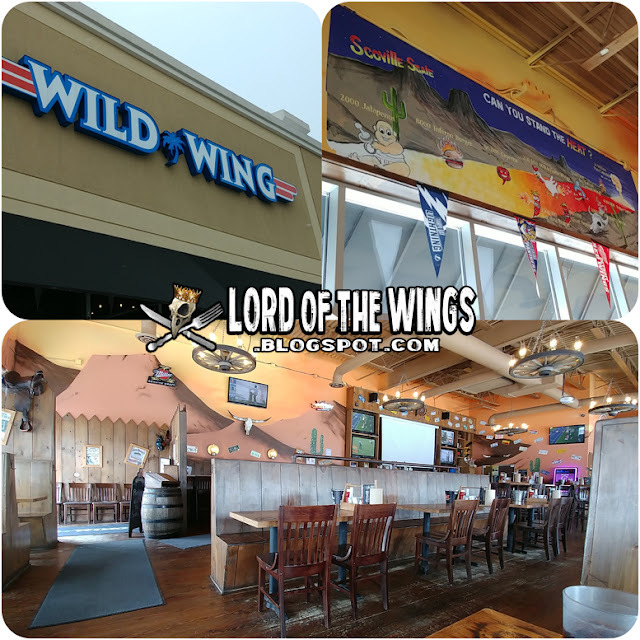 Wild Wing's is famous for it's wing sauces. Or should I say wing sauce combinations. They have 101 flavours, but in actuality, they have like 20 sauces and rubs that they then mix together to make a whole bunch of combinations. They also don't make their own sauces - all are commercial sauces like Frank's and Diana's (a fact they used to advertise proudly on their menus). For me the point of the AYCE isn't to fill myself with as much chicken as possible, but to sample a bunch of flavours. Their listing is broken down into categories like Honey I'm Home (all the honey garlic combos) or Feeling Chippy (all the potato chip flavours). Trying to find classic flavours like hot, or medium can be a challenge, and figuring out all the combos isn't always easy as you have to really track down what the name of one is if you don't know already. I placed my first order, and it didn't take long for me to get round one. Because it was pretty quiet in the place, I could hear the cooks tossing the crispy chunks in the sauce. Round one looked pretty good. There were a pile of fries that came with the order. They looked like fresh fries with their skins still on, but they were clearly frozen. 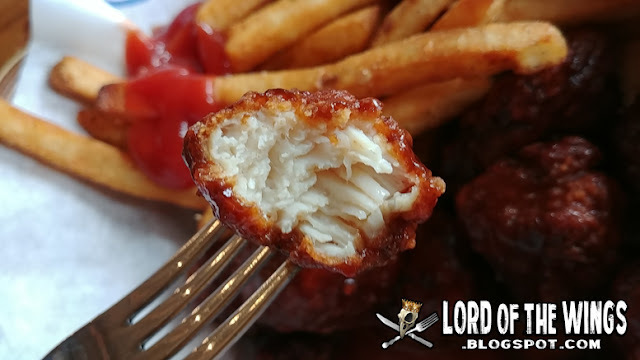 They were decent frozen fries, and were better when I added vinegar and salt and ketchup. There were also fresh celery and carrot sticks (always appreciated with wings) and I had a choice of blue cheese, ranch, or dill dip. While blue cheese is good, I'm a sucker for dill. It's creamy, dilly, it's what you want in a dill dip. 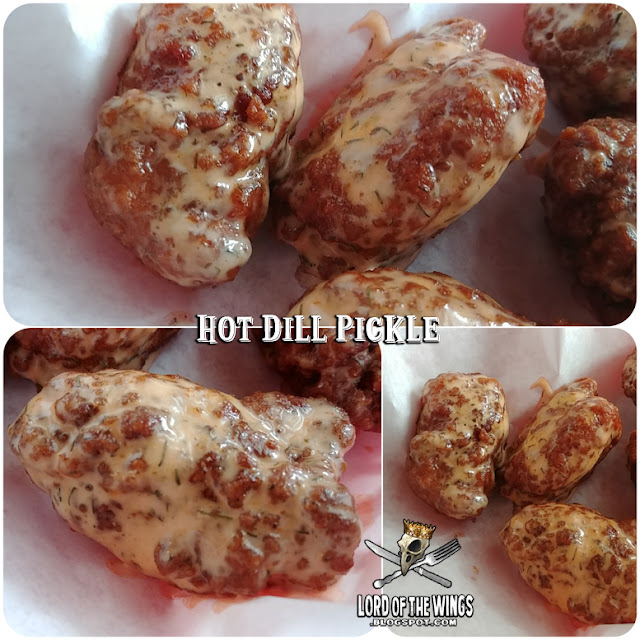 I'm pretty sure this is the same dill sauce they use on their wings too. My first order of Boneless Chicken came with approx 9 pieces. Each order after this came in 5's. These chunks of chicken were all different sizes. 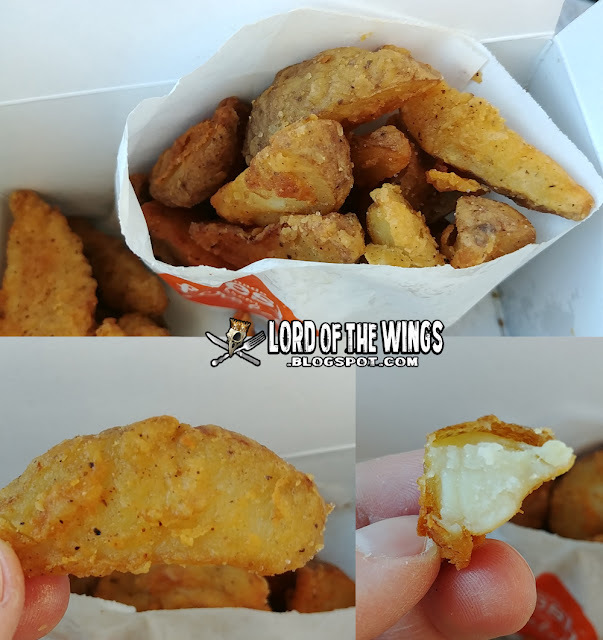 Most of them were small bites that were bigger than say a popcorn chicken, but not much more. There were a few larger chunks in there too. These were roundish chunks, not nuggets, but the size of nuggets. They weren't uniform sized or cut either. 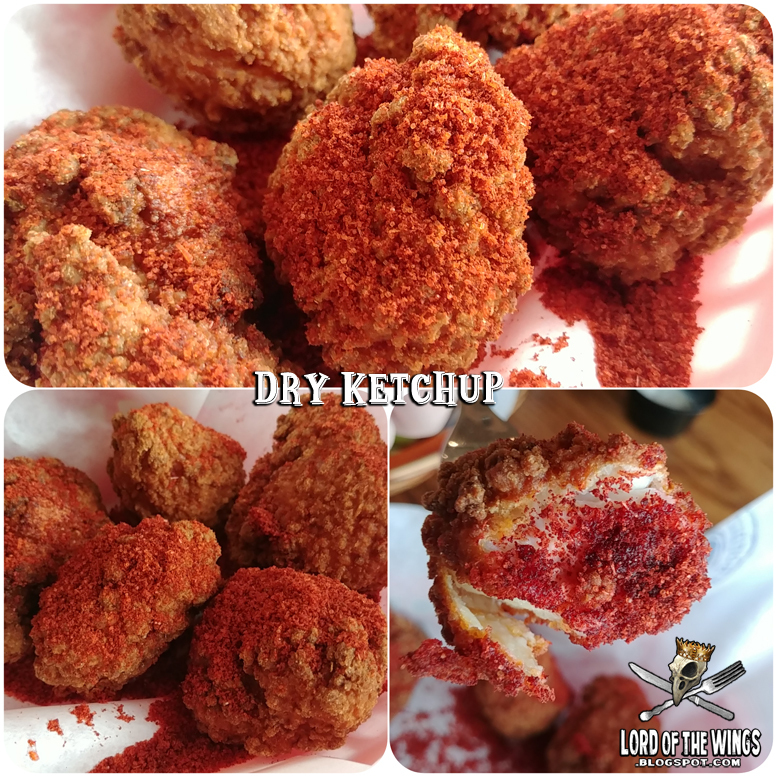 The chicken was breaded, and when deep fried, created a touch crunchy shell. Many on my first order were overcooked and too crunchy. But I will take crunchy over not crispy. At least the crunchy holds up to the thick sauces well. The meat was mostly tender pieces of white chicken. 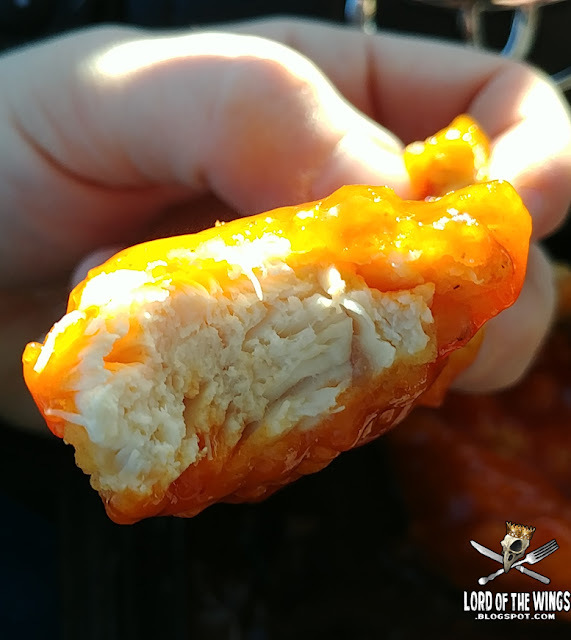 However, one in like 8 pieces were this weird, solid piece of chicken that didn't seem like chicken at all. If it were a pressed chicken product I would understand, but I'm pretty sure they use real chicken breast. 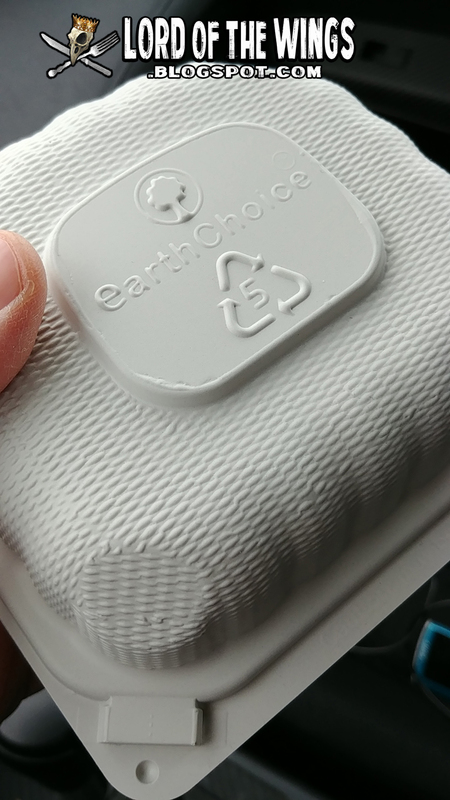 These are a frozen product for sure, so I'm sure that is what caused the every so often crappy piece. My pieces came very well sauced and/or dry rubbed. Round 1 was extremely saucy and had a lake of sauce. Round 2 came with a lot of dry seasoning. Round 3 had wet pieces (mostly) but no extra sauce, and Round 4 had both enough sauce and dry seasoning. As I mentioned before, I'm all about the experimentation, but I also want to ensure I like what I'm having. I had 4 rounds and went with 2 of my favourite flavours, and 2 experimentation. To start off I wanted something saucy, spicy, and BBQ-y. 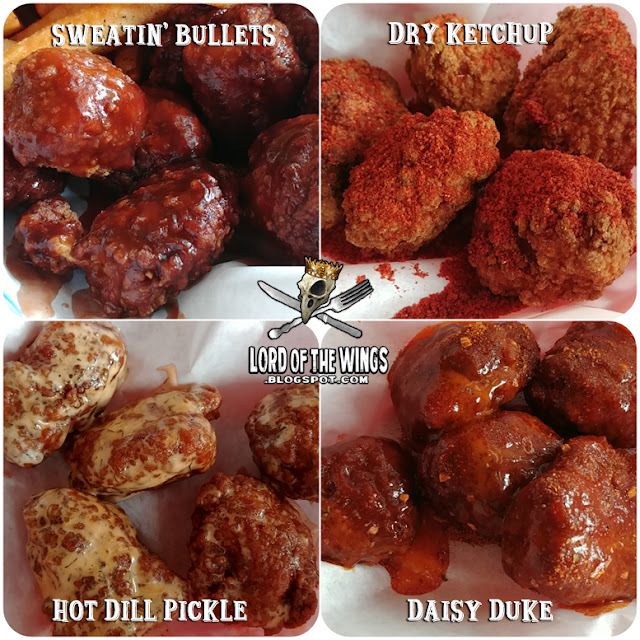 There are a lot of BBQ options, and I went for the extreme, Sweatin' Bullets. "Smokey BBQ + Xtra Hot + Spontaneous Combustion" sounded what I was looking for. This sauce was very very very hot. Yes the BBQ aspect was pretty smokey and had a slight sweetness (but it was mostly a savory dark BBQ). 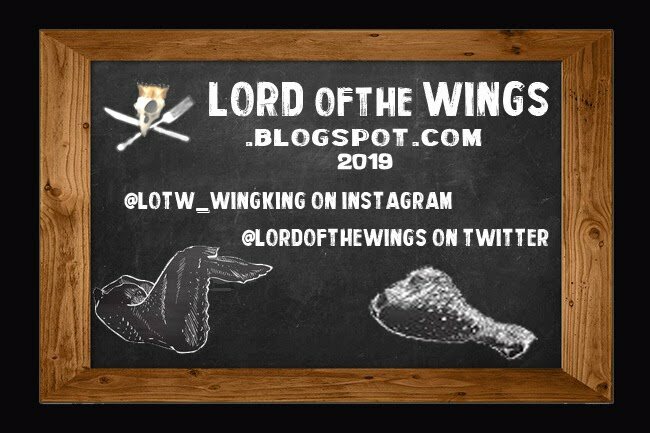 Heat wise, these wings were actually killer. It was a peppery fire, a sharp pain that went after the tip of the tongue. 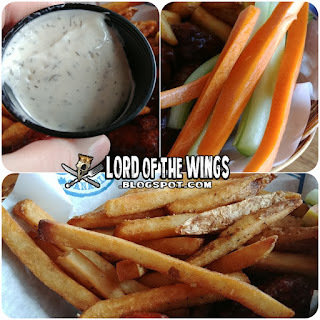 The heat really stuck around even after having veggies & dip, fries and my drink. 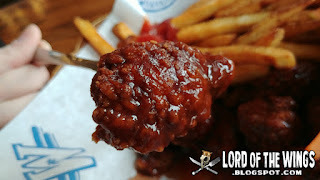 It actually overpowered the BBQ sauce. In my heart I really wanted a more BBQ heavy sauce, but my ego went for the spicy. So this sauce isn't bad, but I would go for a lesser heat more flavour sauce next time. 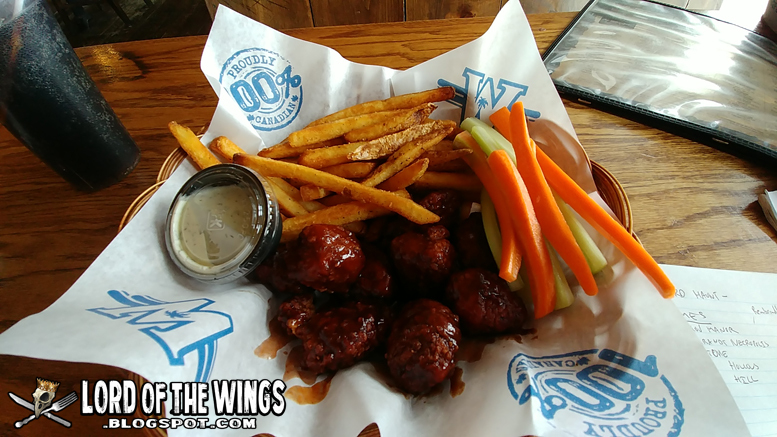 Ketchup chips is one of my favourites, and this is one of my favourite rubs at Wild Wings. I usually order this with a side of sauce (but I knew I had lots of sauce leftover from Round 1). Actually when I usually order this I ask for extra seasoning because its often not enough, but this time I didn't and they came loaded with dry ketchup seasoning. It tastes like ketchup and it doesn't at the same time. It's like a sweet BBQ without the savoury, but also has a slightly sour vinegar kick to it. It was best when cutting a chunk in half, then dipping the exposed chicken into the seasoning. I also really enjoyed dunking my Sweatin' Bullets into it. Definitely would have again. One of the most straight forward names on the whole menu - it's hot sauce and creamy dill dip. It's also one of my regular flavours when I come. 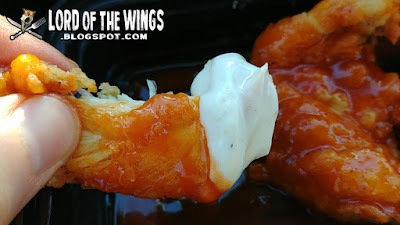 I'm not usually a big creamy wing fan, but this is something I really like. What's not to like? 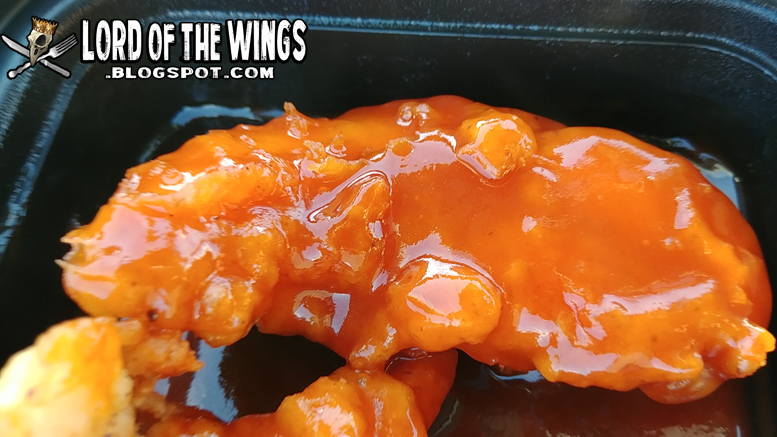 It's creamy, cooling dilly ranch flavour, with some spicy hot sauce mixed in. How could you not like it? Well I guess if you don't like creamy wings or tangy dill I suppose. I almost didn't get this round. Round 3 I was feeling pretty full when Ally came to check on me. She asked if I wanted another round, and I said while I wanted to, I didn't think I could make it. "You got this, c'mon you can do it" she said. 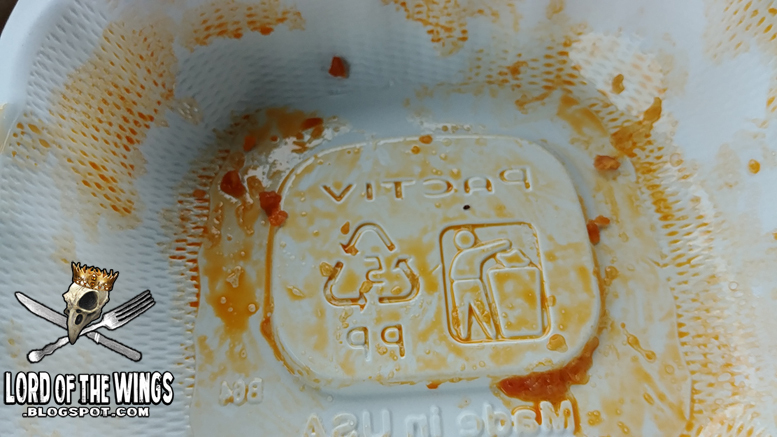 Then she sweetened the deal and said if I got it she would bring me a take-out container in case I didn't finish. Sold. That was pretty awesome and I loved the encouragement about 'having this'. 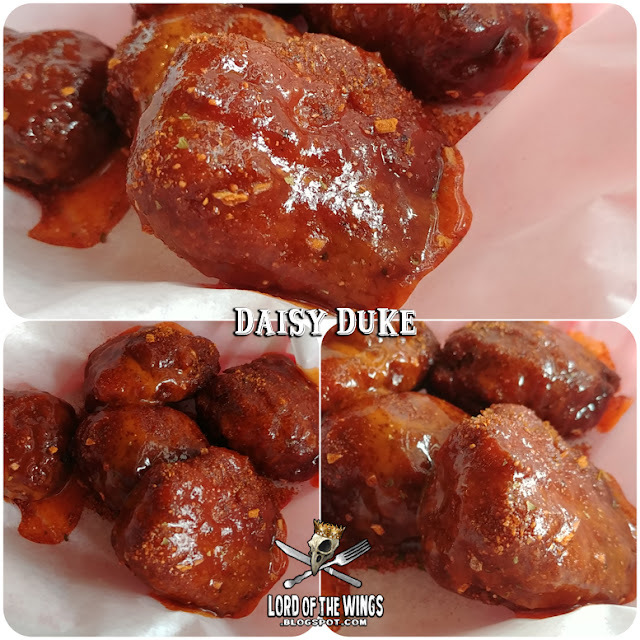 I went out of my comfort zone and got Daisy Duke: BBQ + Medium + Dry Mango Chipotle. Wow, that sounded really interesting. This was all over the place, and it looked great with a saucy glaze. It had 'heat', it had BBQ savoury/sweet, and the dry rub was also sweet, spicy, smokey. Really unique. I think 5 pieces was just right for me - I wouldn't want a large order of these, but they were good for sampling. Overall I had a good experience. Service was good, fast, and I was well taken care of. The boneless chicken was mostly good - sometimes too crunchy, with a few weirdly hard pieces of chicken. They were all sauced/rubbed up nicely too. It's hard to choose between 101 flavours, but I went with some good ones, and have a better idea next time what to get. Don't you get excited too?!?! Don't I make it look easy? Don't I make it look good? Back in 2014 I tried Mary Brown's Chicken & Taters for the first time. My friend Helen, a displaced Maritimer here in Ontario took me and I had some good wings. I had fully planned to do a review, but life was crazy back then and I never did. 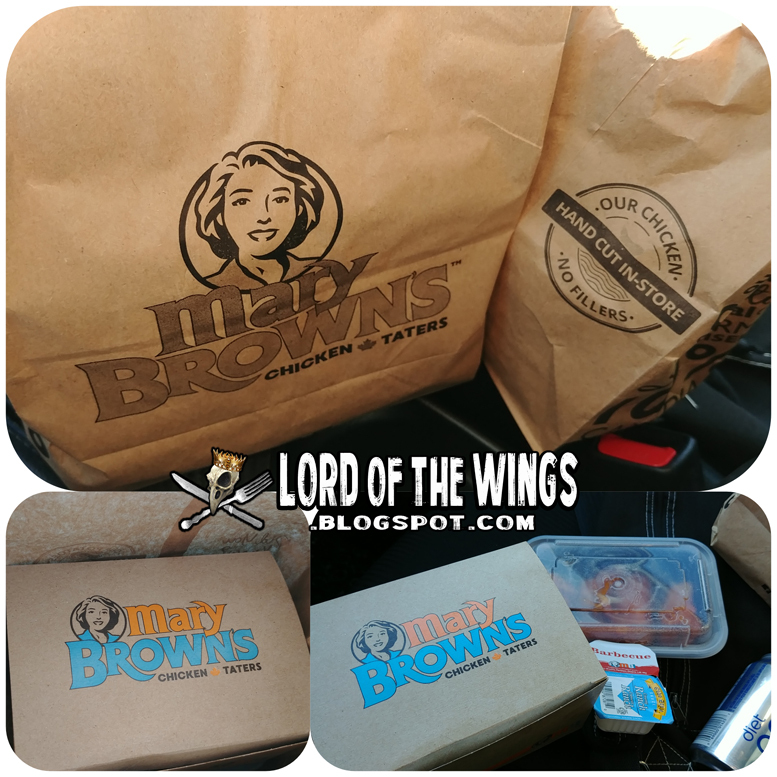 But recently I found the photos and presented a Lost Review because I had heard about a new Mary Brown's opening up in nearby Kanata, and I thought I would compare experiences. 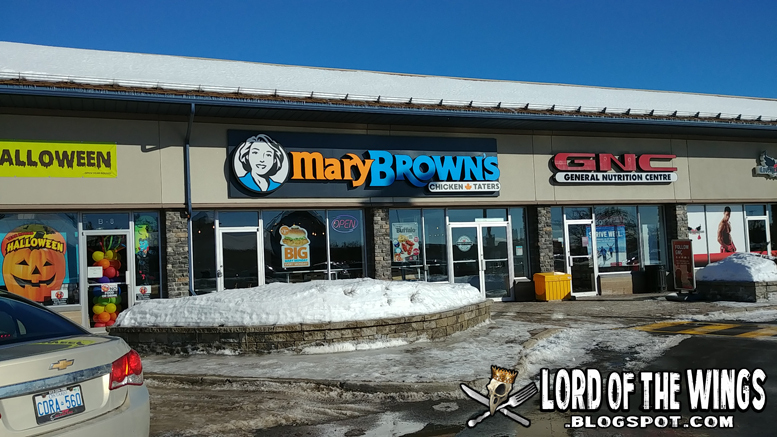 Social media was a buzz with a new Mary Brown's opening, and Maritimers here in the capital were salivating with anticipation of having their favourite fried chicken and potato wedges. Following their obsession online, it seemed that the store that opened in February was crazy busy with big line ups. I waited till things died down and decided to check them out. 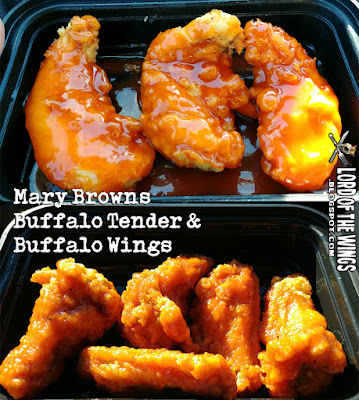 Also, I was getting ads from Mary Brown's on social media about Buffalo chicken tenders. That really piqued my interest and it was a limited time offer, so now I had to go. The new shop is in the Kanata Centrum - a big shopping zone that is basically Kanata aside from suburbs. The place is brand spanking new: clean and shiny and very fresh feeling. There's lots of seating inside, lots of space, and bright colours and window space. I went after lunch time so it was quite quiet. There was only 1 patron eating, and one staff member on break. More came later, but for a bit it was just me. 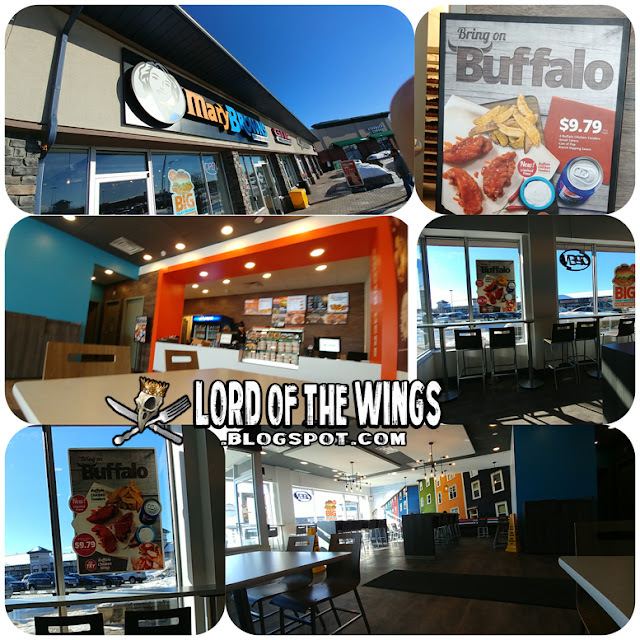 I noted the Buffalo tender combo posters upon entering, and I walked to the back where the ordering counter was. I was impressed because there seemed to be a small army of staff running around. I was the only one at the counter, and I was taken aback by the staff member who took my order. She was young, and she didn't give a damn. I expect that at a place that has been around for a long time, but usually when a place is new, the staff are excited. She was not. 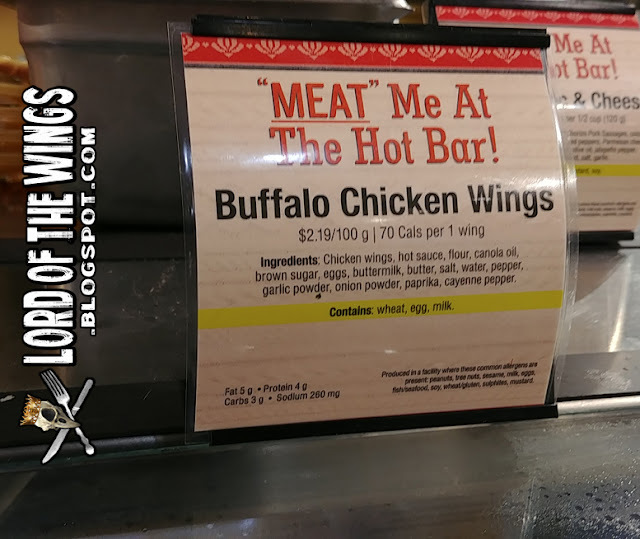 I pointed to the sign and said I'd like the Buffalo tender combo. She asked what kind of dip I would like and I asked what kind were there? She kind of listed off her head a few but I picked ranch. I also added 5 wings to the order. She asked if I wanted a dipping sauce for that, she said there was Buffalo, Ranch, something else. I went, oh Buffalo. She then gave me my receipt and I waited for my order. I waited for about 10 minutes, and I watched as who I thought was an older manager, putting my order together. She called my name with one big bag and a little bag. I asked if it came with a drink (as the combo did, but the girl didn't ask me what I wanted) and the woman said it was in the bag. I opened the bag and it was a Pepsi, but I wanted a Diet Pepsi, so she exchanged it for me. I should point out it's a can of pop, not a fountain drink. I went back to the car with my order very excited. I sat down, got everything set up, and opened the bag. I found the wings and put them aside. 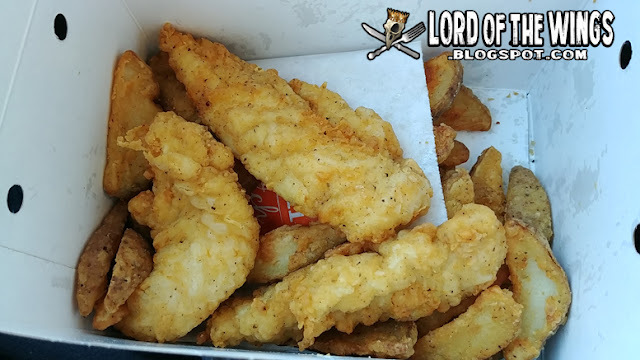 I pulled out the tenders, and I opened the box. 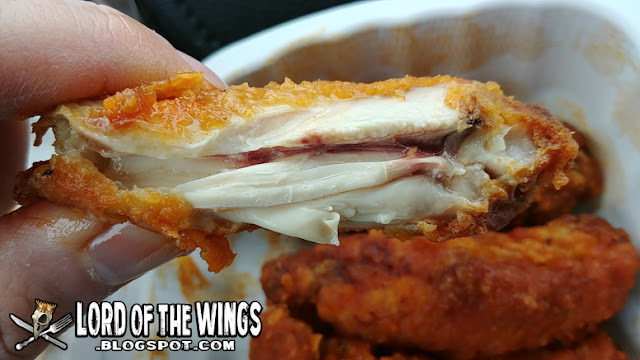 Inside, was just plain chicken tenders. I was really disappointed. I also noticed that there was no Buffalo dip but a BBQ dip in the bag. I checked the receipt and there was nothing about Buffalo tenders. 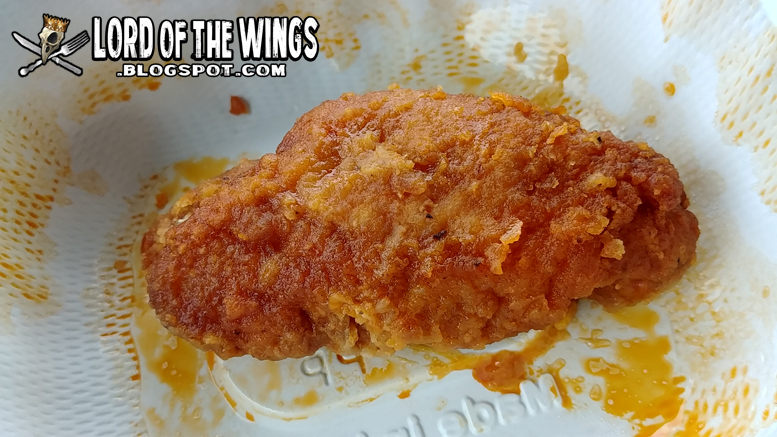 Now I normally not the kind of guy who complains or sends food back, but I came to do a Buffalo tender review. I went back into the restaurant and now there was a good size line. The girl that took my order was going on break, but saw that I was coming back in with an order and avoided eye contact with me. 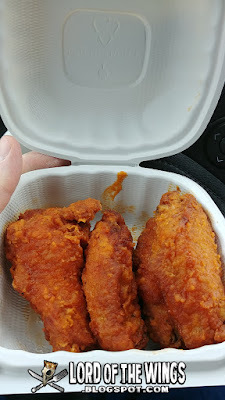 The woman who had packed my order saw me come back in, and I explained calmly and friendly that I didn't get the Buffalo tenders or the dip. 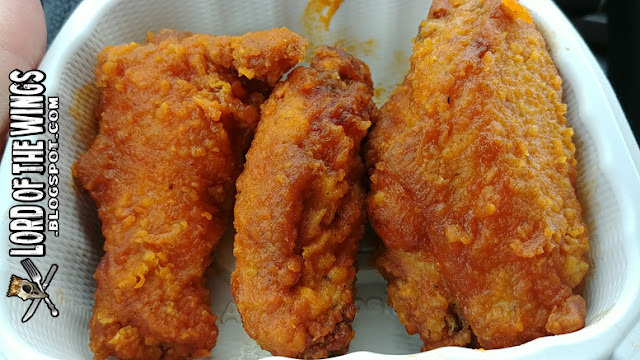 I tried to give the original tenders back to be sauced, but she re-ordered a new order and told me I could keep the original tenders because they screwed up. 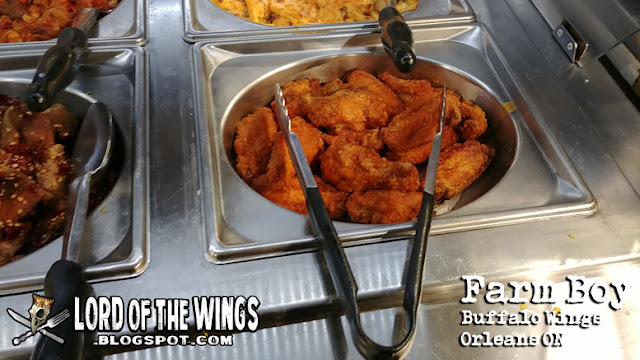 Then she asked if I wanted a side of Buffalo, because as it turns out, there is no Buffalo dip as the girl had suggested, it's just the sauce the wings come in. The girl had led me astray and now it was confusing and embarrassing dealing with the very competent employee. The lady got the order and asked if I wanted a side of the Buffalo sauce but I said no because I didn't want to cause more conflict. She also offered a coleslaw or some other side to make up for the mix up, but I declined. I really appreciated how much she went to make things right with me. Back at the car, I tried out the taters first. The combo comes with a small order, but these were overflowing from the bag and into the box. These are essentially small small small potato wedges that are breaded and fried. They are, ok. Texture wise they are good - crispy outside, fluffy potatoes inside. But they are mighty blah. Actually they have a bit of a floury flavour. I mean I still gobbled them down and dipped them, but they weren't as amazing as people seemed to claim. 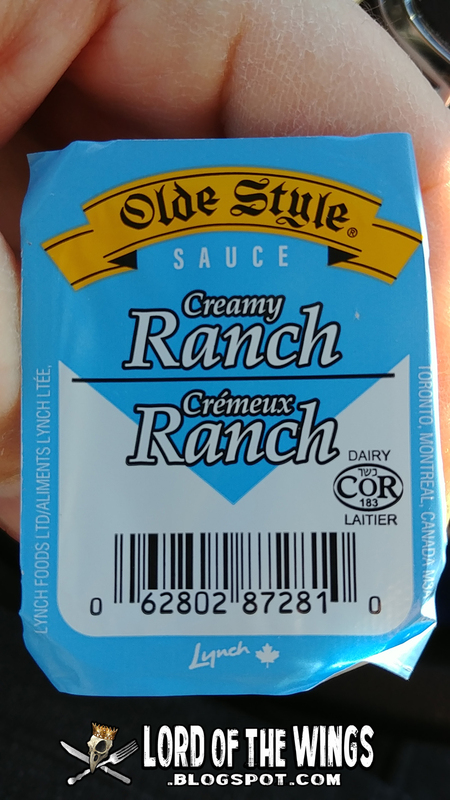 Mary Brown's uses Olde Style sauces as their dips, and in this case it was ranch. 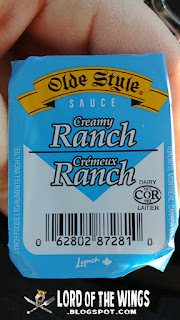 The ranch was good, and reminded me of the base for a commercial tartar sauce I used to love as a kid. And hey, it's kosher! 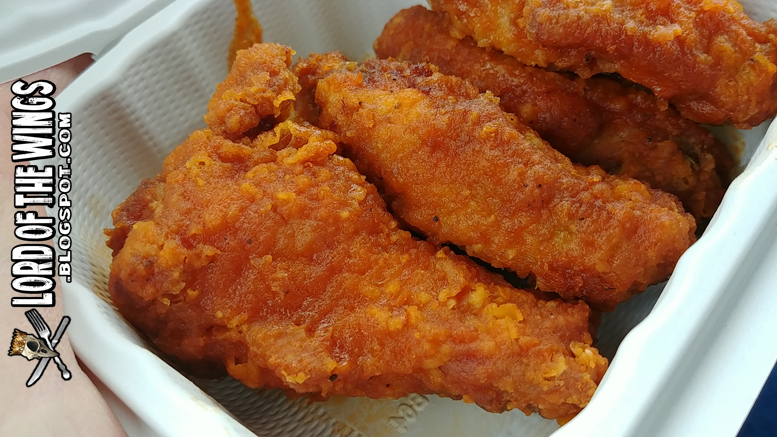 I moved onto my freshly made Buffalo tenders. These looked and smelled really good. Size wise these tenders were pretty big. They also weren't pre-cut or formed tenders but real chicken breast pieces. They are lightly breaded and were lightly fried, which meant they weren't as crispy as I would have loved, but they were good. The meat was very tender. Very. Tender. 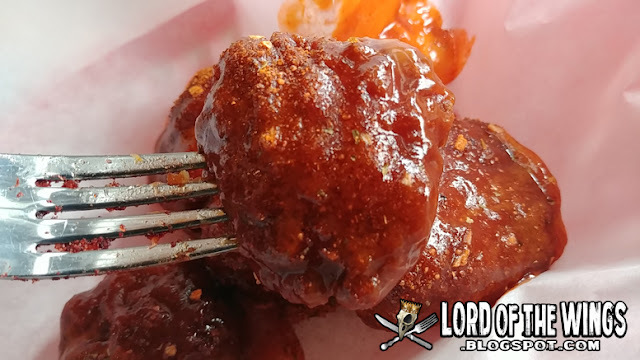 On a side note, the original tenders that were not sauced were the same and were good on their own (but I did end up throwing them in with the sauce and tossing them). 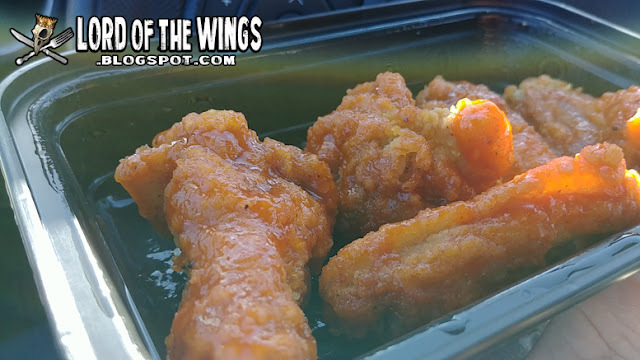 The sauce on these were described as Buffalo, but it's not really Buffalo, but as its the same sauce as the wings I will leave it for the wing review portion. I will say they came VERY saucy. I like that. The flavour all around was good - these were great 'boneless wings' which thankfully they don't describe these as. And the ranch was a great flavour booster for these, but it wasn't needed. 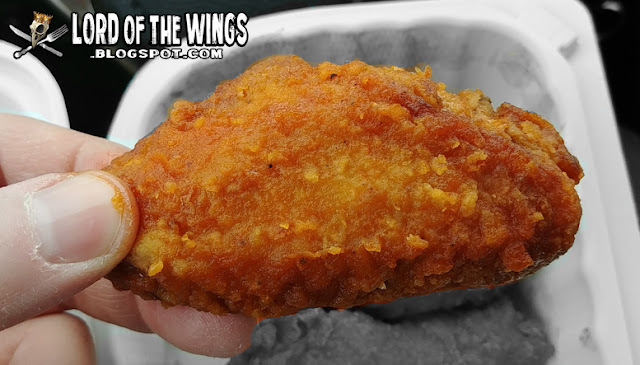 So the tenders were pretty good, but how would the wings fare? 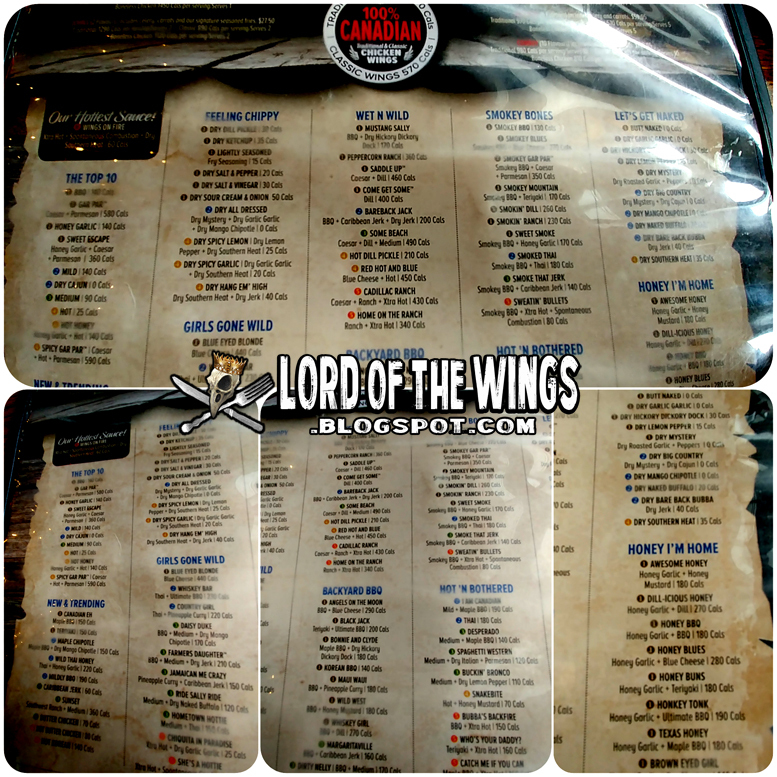 There is only one size choice of wings, 5 wings, which are found under snacks on the menu. 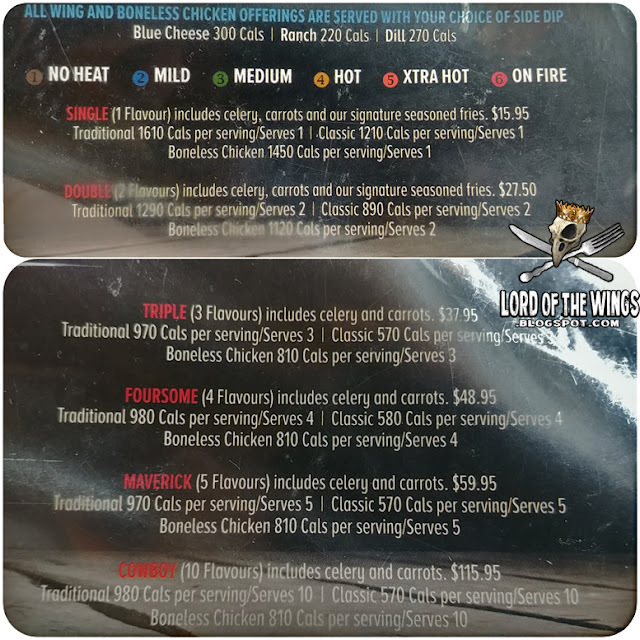 5 wings are 5.99 but if you want to upgrade to a combo for $3.50 more. It also came with a dip, and I got more ranch. 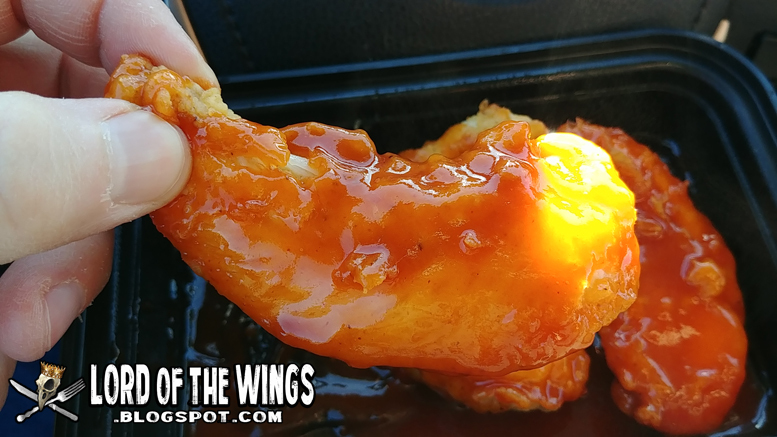 These wings are all about the same length, basically a medium. 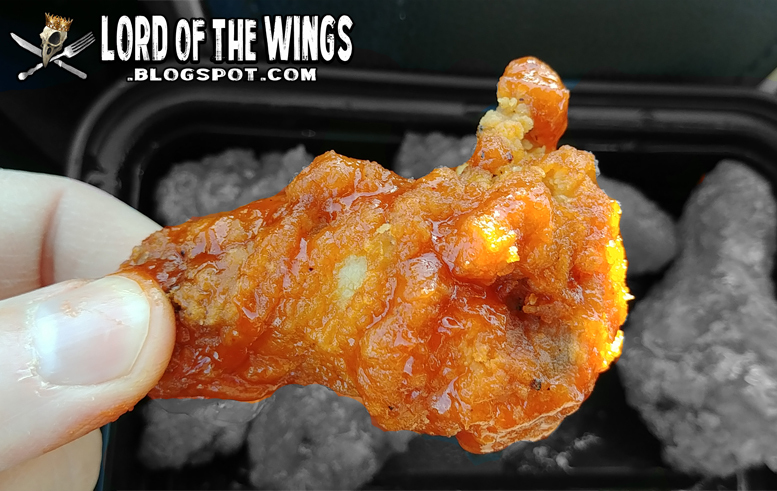 But the chicken on some of these wings were very meaty, which makes up for the smaller length. They are lightly breaded/dusted like the tenders.The skin was crispy, but after a bit the sauce gets to the skin and creates a slightly spongy texture. They weren't bad this way, but as always it's best to eat them as quickly as possible. The meat was pretty tender though. Actually super tender, with the bones pulling away easily. The sauce on these wings is labeled as Buffalo, but this is not a Buffalo sauce. It's the same sauce as the tenders. It's a hot sauce, it's commercial tasting which is not bad, but it's obviously not a scratch sauce. It's syrupy and slightly sweet, so I'm sure its got high fructose corn syrup in it. There is just the slightest sting but these would be edible by all level of heat or non-heat eaters. They were also really wet with generous amounts of sauce on them. Make sure you have a napkin or two. To see the original post click HERE. I'm always on the hunt for new chicken wing sources, and during the Super Bowl, wings are everywhere. I was not expecting to see them at Farm Boy. In their grocery flyer, I had seen that they added 'Buffalo' wings to both their Hot Food Bar, but also in 1lb packages. Now I didn't get these for the Super Bowl, but I did check them out after. 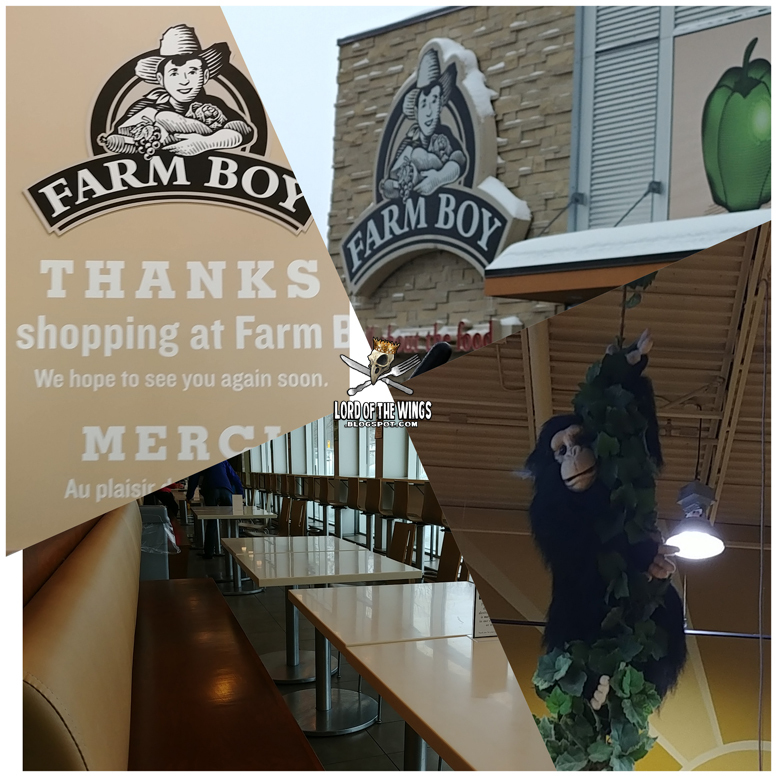 If you are not familiar with Farm Boy, it's a grocery store chain that started in the Ottawa area. 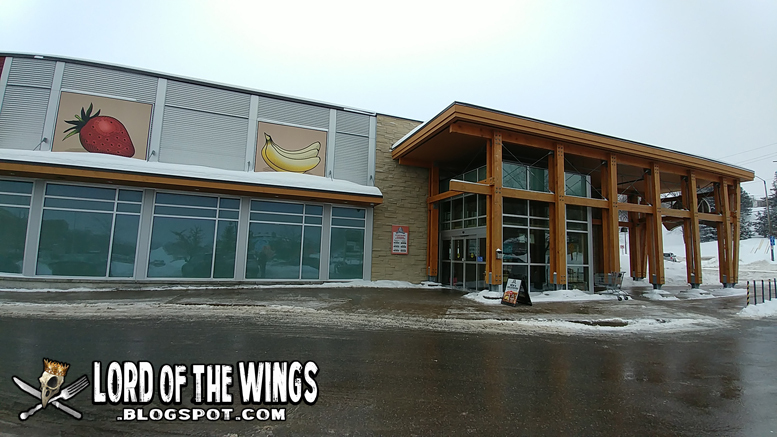 They focus on fresh produce, organic items, and their own in-store brand items. If you are from the US, I think Trader Joe's would be the closest comparison. 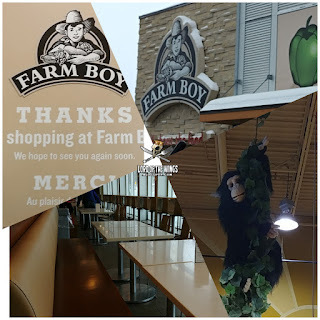 I like Farm Boy and their wares, but I find it quite expensive and don't grocery shop there much. 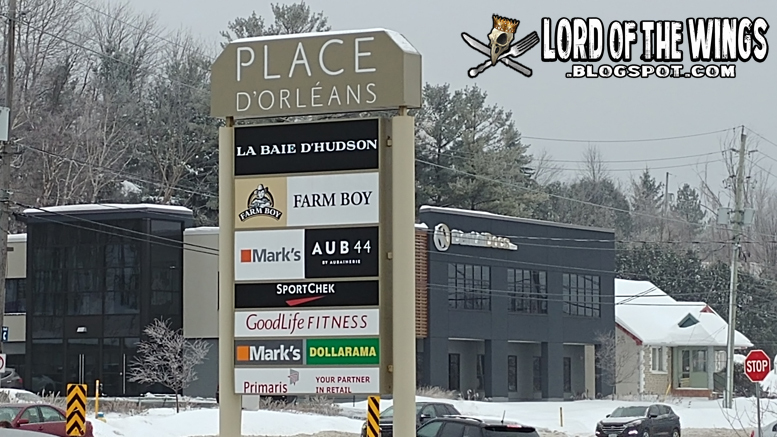 This particular location in Orleans is by far the biggest I've seen yet. 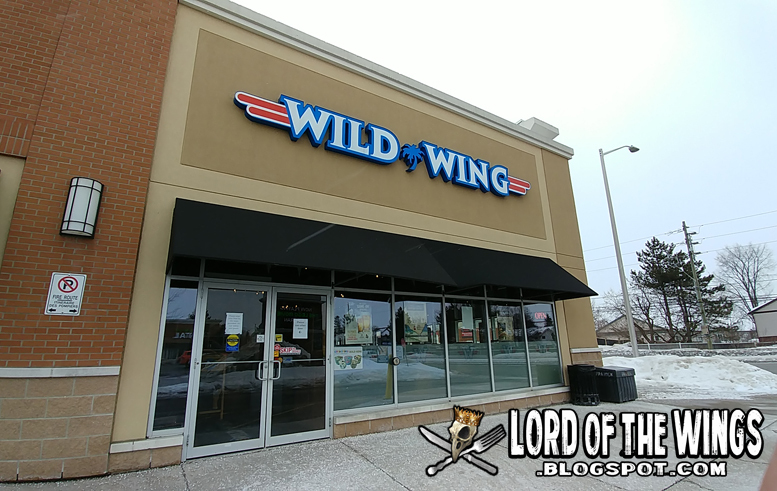 Large layout that even has a large dine-in section to it. What I have primarily come to Farm Boy for is the fresh food. They make a wood fired pizza, or even have a tasty stir-fry station. They have soups and sandwiches, a salad bar, cold bar and a hot food bar. 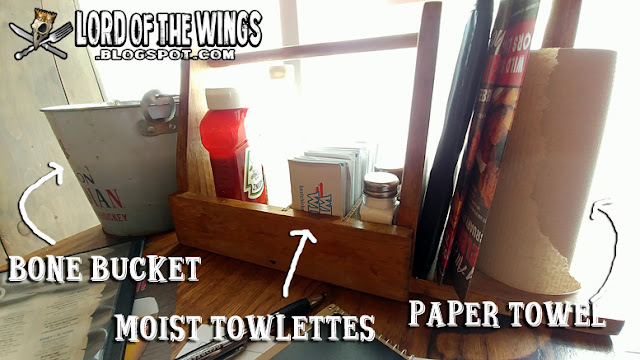 I looked around and the first hot food table I came to had the wings; I kinda expected to have to hunt around and not find them and then have to ask, but hey, there they were! 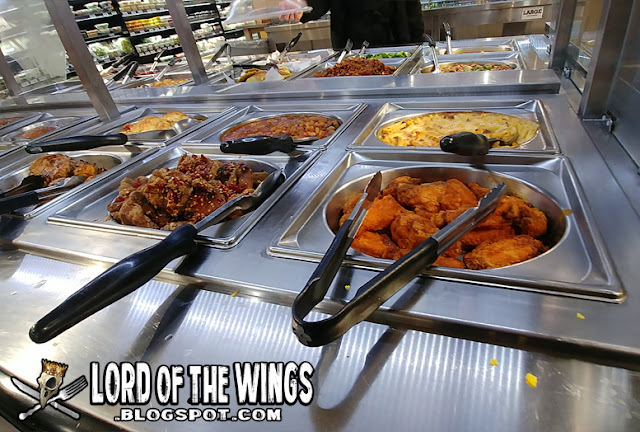 On the end of the hot food tray were the wings, besides an asian beef dish and across from some pasta. Sitting in the warm food tray were about 10-14 wings just waiting to be self-served to go. 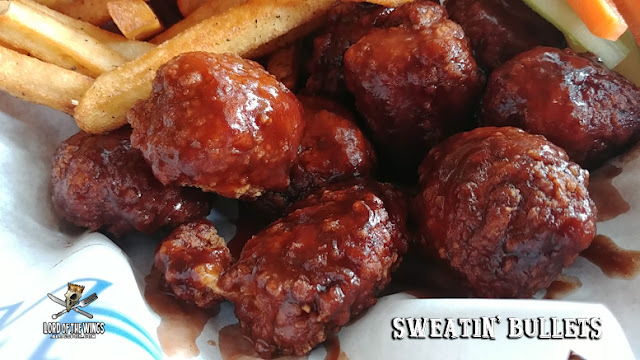 I could smell the intoxicating aroma of hot wings and it got my mouth watering. 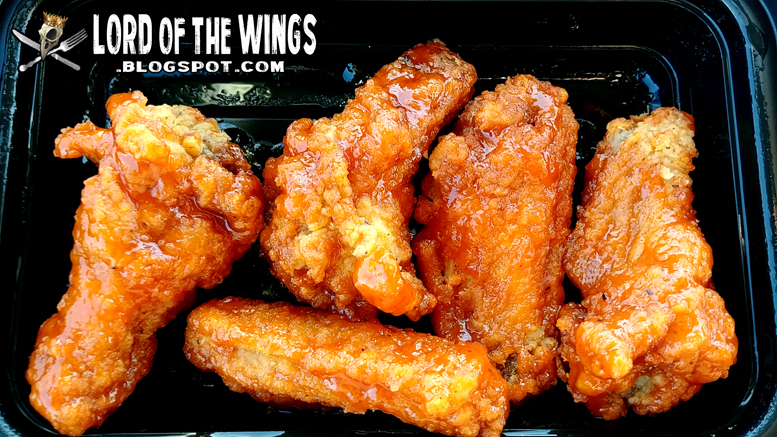 They looked to be a good size, but a little sad because wings aren't meant to wait in a heating tray. I was very skeptical of the 'Buffalo' nature of these wings, especially after reading the ingredient list. The first two ingredients were spot on: chicken wings and hot sauce. But after that, we get flour, brown sugar, eggs etc, none of which you would ever find in a Buffalo wing recipe. That doesn't mean they wouldn't taste good, but the naming was going to be wrong. The take-out containers are recyclable plastic clam shell style containers. I wasn't looking to feast, just sample, so I put 4 in the container, grabbed a drink, and headed to the cashier stand. It, like the store, was super quiet. The cashier weighed my 4 wings, which came to $5.58. Wow they were not cheap. 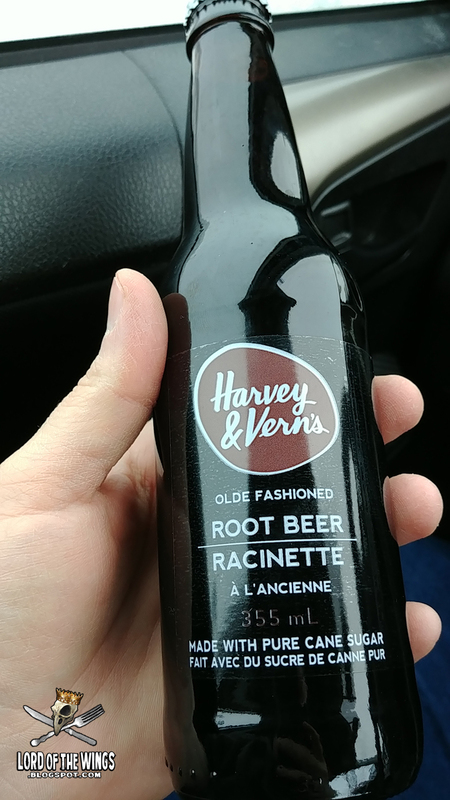 I also grabbed a bottle of Harvey & Verne's Olde Fashioned Root Beer ($1.49). Brewed at the Kichesippi Brewery right here in Ottawa, this is a very good beverage. Its creamy, smooth, sweet with hints of vanilla. Really really nice. So I went back to my car, cracked open the drink, and got ready for my Farm Boy wings. 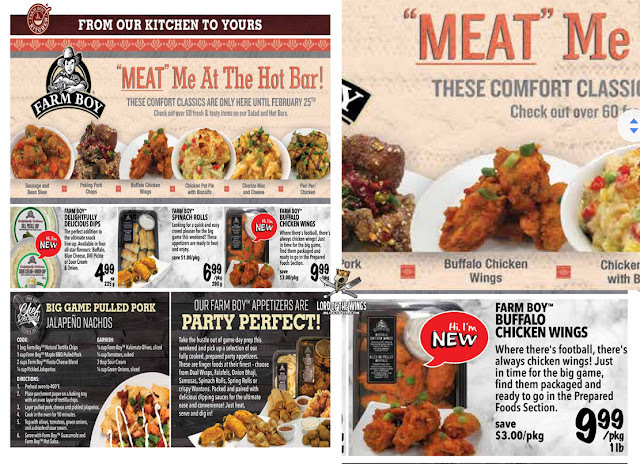 NOTE: this versions Meatiness is incorrect and should say Meaty to very meaty. 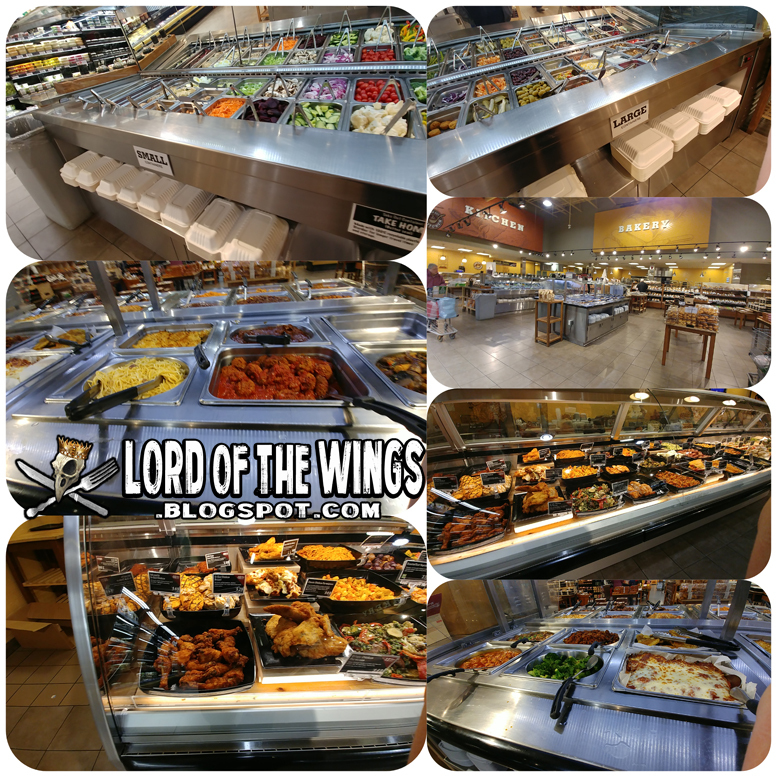 Because it was self service, I got to pick out the best looking wings in my opinion. 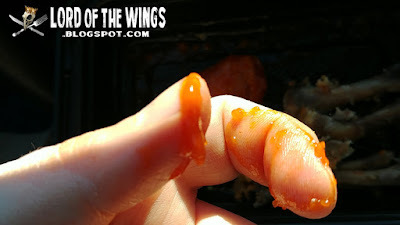 The wings were not saucy at all, and there wasn't really any extra sauce in the pan for me to mix my 4 wings into. 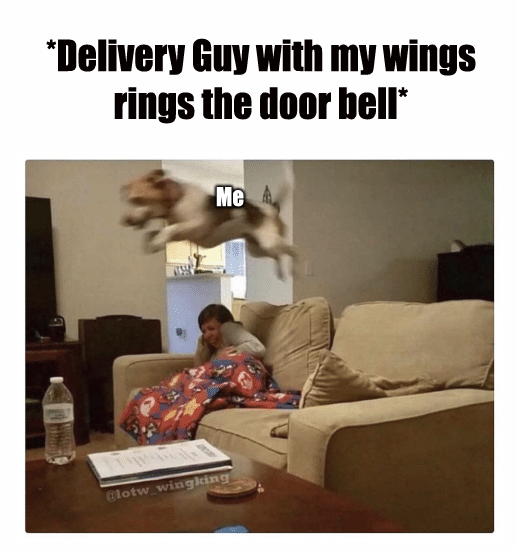 The wings were big, I will give them that. They were long and came from a big bird. 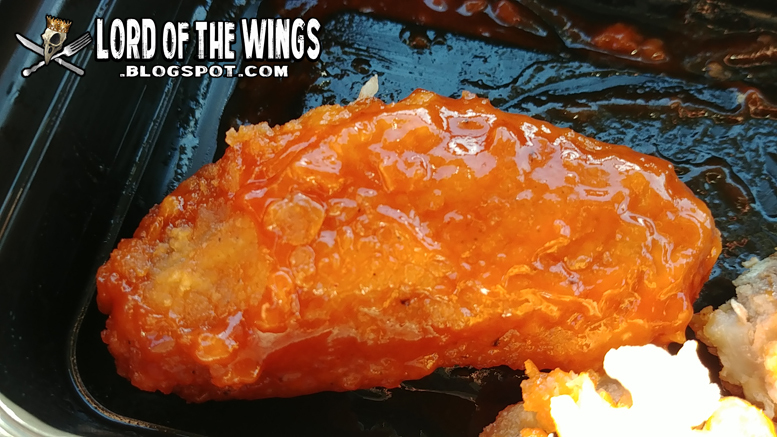 The wings came lightly dusted or breaded, and I couldn't tell if they had been deep fried or baked. I think fried, but because they were sauced and then left in the heating pan, there was no way of knowing. I guess I could have asked. The skin was kind of crispy, but also soggy due to the sauce and the heating pan. 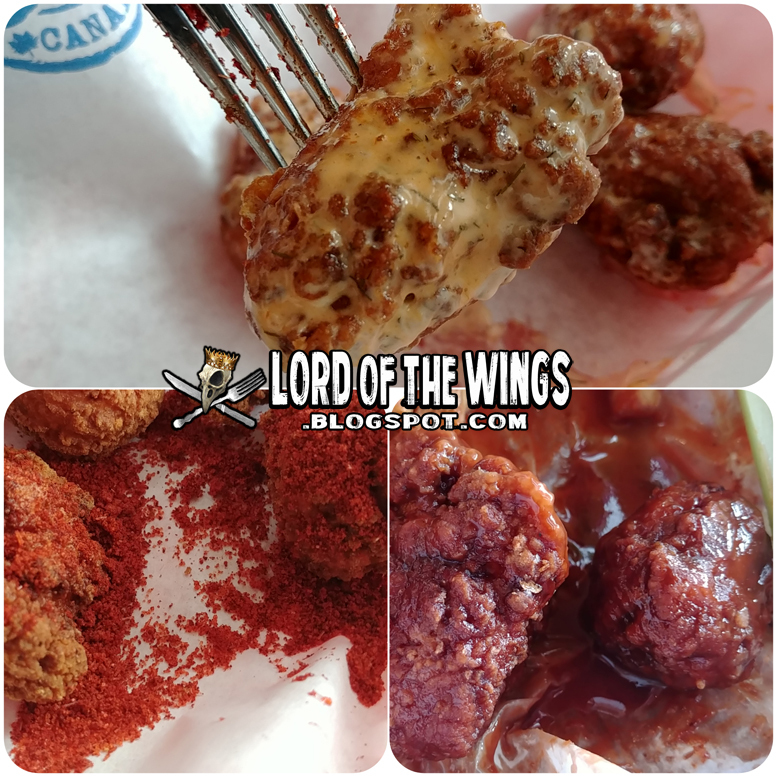 The wings were pretty meaty, but the texture was all over the place. Some parts of the chicken were very soft and tender, while others really tough and chewy. In some cases I had a hard time pulling the meat off the bone with my teeth. I also had a hard time pulling the bones apart. The texture is probably the biggest issue with these wings. 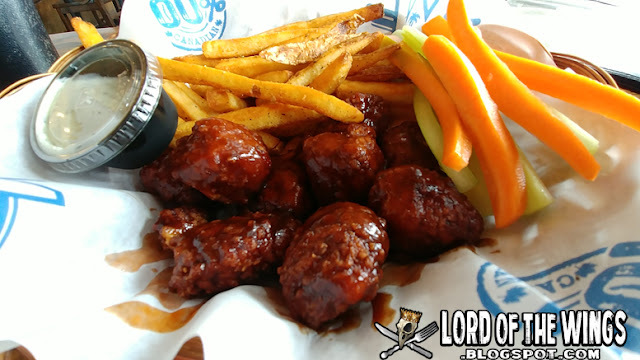 Now these wings were billed as Buffalo, and so far these wings were failing as Buffalo wings, so it was up to the sauce. But the sauce was not Buffalo either. What?! I mean there was hot sauce in there, but there was also a lot of sweetness, and not enough butter. It's got a little nip of heat, and it's tangy. 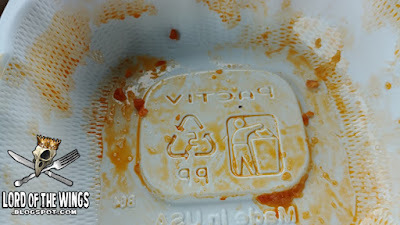 I actually did like the flavour of the sauce. Really good. Just not Buffalo sauce as advertised.